Campbell Soup, the world's largest soup maker, reported quarterly revenue that fell short of analyst expectations as sales growth in its core U.S. soup business slowed, sending its shares down 3 percent. Under a turnaround effort led by Chief Executive Officer Denise Morrison, the company has been revamping its offerings with new varieties of soups and sauces, and improved advertising as it looks to reverse several seasons of weak soup sales. While these actions have helped sales for the past few quarters, the company warned that the new launches and marketing would pressure profit growth in the current quarter. Growth in its U.S. soups business eased to 4 percent in the fourth quarter, from the 9 percent it clocked a year earlier and the 14 percent last quarter. Campbell (CPB), which also sells Prego pasta sauces and Pepperidge Farm cookies, is trying to move away from its traditional soup business and into fast-moving perishable goods. "We expect soup to account for about one-third of our sales [in fiscal 2014] versus more than 40 percent in fiscal 2012," Morrison said on a conference call after the company reported a better-than-expected profit for the quarter ended July 28. Morningstar (MORN) analyst Erin Lash said she was impressed with the growth in the soup business in the quarter which came during the summer and against tough comparisons. She has a "hold" rating on the company's stock. During the past year, Campbell has bought Bolthouse Farms, which makes refrigerated salad dressings and baby carrots; Plum Organics, which makes baby food; and cookie maker Kelsen as it looks to grow its fast-moving perishable goods business. Though quarterly sales rose 13 percent to $1.82 billion helped by such deals, it fell short of analysts' estimates of $1.84 billion, according to Thomson Reuters I/B/E/S. The shortfall was also due to weak U.S. drinks business which fell for the fourth straight quarter as its V8 vegetable juice faced stiff competition from energy drinks and packaged fresh juices. The Camden, N.J.-based company has earmarked some European businesses for sale and excluding these operations, total sales were $1.72 billion in the quarter. Campbell said it expects sales on this basis to grow 5 to 6 percent in fiscal 2014. Adjusted earnings are expected to grow 3 to 5 percent. Fourth-quarter adjusted earnings rose 9 percent to $142 million, or 45 cents a share, beating analyst estimates of 42 cents a share. The company's shares were down 2.7 percent at $43.47 in afternoon trade on the New York Stock Exchange on Thursday. It seems that in one corner of Germany, it just isn't safe to transport food in trucks anymore. In the small town of Bad Hersfeld, northeast of Frankfurt, thieves are running off with literally truckloads of goods. In August, 34,000 cans of Red Bull were robbed off a truck; in March, 30,000 euros ($40,000) worth of coffee; and this month, five tons of Nutella. That's 16,000 euros ($20,800) worth of chocolaty hazelnut goodness. It seems unlikely that a sweet tooth was the motive for that latest crime, but rather the odds of being able to move the spread easily and profitably on the black market. A large jar of Nutella can cost upwards of $6.50, even at discount retailers like Walmart (WMT). 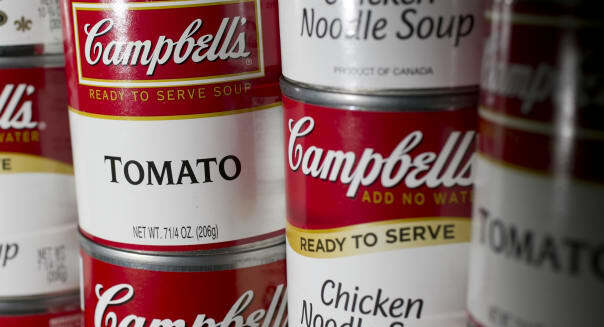 An Orlando, Fla., man should have studied the work of his German counterparts better before he decided to hijack a trailer full of Campbell's soup this month. Investigators are unsure of the motives behind the crime -- Black market sales? A terrible cold? -- but after a 30-mile chase that involved a helicopter and K-9 law-enforcement unit, he was caught and the $75,000 worth of canned soup was safely retrieved. "The court has seen many things stolen ... This is the first time the court's ever seen $75,000 worth of soup stolen," Broward County Judge Jay Hurley told the 51-year-old at his arraignment. Canadians are known for their love of maple syrup, and Quebec has been called the "Saudi Arabia of syrup." So perhaps it's only natural that someone might view it as a liquid asset. Last August, the Federation of Quebec Maple Syrup Producers discovered something strange in their stockpile. Someone had snuck off with $30 million worth of pure syrup, leaving behind barrels filled instead with water. There was panic. If that much syrup was released onto the black market, prices would be driven down and producers would suffer. Fortunately for breakfasts everywhere, in December, Canadian authorities raided a facility in New Brunswick and recovered most of the stolen goods. In February, as a Krispy Kreme driver was making a delivery to a gas station convenience store in Dacula, Ga., a man police later identified as James Freddy Major jumped into the truck and took off, giving those on the road that night the once-in-a-lifetime opportunity to see a convoy of police cars in hot pursuit of a doughnut truck. After running a couple of lights, Major rammed into a mailbox, then attempted to escape on foot. He was tackled by a police dog and eventually arrested. It was, according to media reports, his 11th arrest in Gwinnett County since 1999. A man from Illinois used fake paperwork to trick a Wisconsin cheese producer into loading $200,000 worth of Muenster on to his truck. He was arrested in New Jersey and the cheese recovered. However, the company, K&K Cheese, doesn't want its 42,000 pounds of cheese back because of concerns that it may have been tampered with. Instead, they will donate it to charity, if it gets cleared by the New Jersey health inspectors. Maybe this thief didn't get the memo that the cheese bandit had been caught: He ran off with $100,000 worth of hamburger patties this month. The aspiring hamburglar struck at the shipping yard in New Jersey, rolling of with a shipment of burgers originally destined for The Netherlands. A spokesperson for the Linden Police Department said that food crimes like these occur frequently, and if the loot is not recovered within 48 hours, it has probably already made its way onto the black market. Not every grocery-related theft involves edible items. Supermarkets, discounters and other retailers have all been victims of unusual crime trend recently: People stealing Tide laundry detergent. And it's no small matter: Some stores across the country are losing $10,000 to $15,000 worth of detergent a month. After a series of such thefts were reported to them, police in Maryland started to get suspicious; it seemed like a more complicated matter than just random petty thefts. Turns out, all those shoplifters weren't just eager to wash their clothes; they were trading the Tide for drugs. Laundry detergent has become a popular item to barter for illegal drugs or sell to black market operations, because it's impossible to track, doesn't spoil, and everyone needs it. Tide, which is the nation's most popular detergent brand, is also significantly more expensive than most other detergents. Like the maple syrup we mentioned before, Tide, too, has earned the nickname “liquid gold" for its value as street currency.